From Pentecost 2012, the Bishops of Australia have invited all Catholics throughout the country to join with them in a ‘Year of Grace’. This Year is an invitation for the entire Church community in Australia – bishops, priests, religious and lay faithful – to ‘start afresh from Christ’. But if we are to embrace well this special time, it might be helpful to take a little time to reflect about the experience of grace and how it operates in our lives. “Grace to you…!” exclaims St Paul at the beginning and the end of every single one of his letters. These were his permanent words of greeting and farewell. Grace formed the bookends, so to speak, of all that Paul thought and wrote about. Grace was the invisible thread that bound together his proclamation of Jesus Christ. Whenever Paul wrote about ‘grace’ he used an ancient Greek root-word: cháris. The most basic meaning of cháris is this: ‘that which delights’. Grace is a delight for the person who receives it; it is not a difficulty sent to be endured. This suggests, therefore, that the word ‘grace’ is closely related in meaning to the word ‘joy’, which itself may be defined as something good that brings delight. And this is exactly the case: ‘joy’ in ancient Greek – chará – is one of the words which shares its roots with cháris. Whenever Paul was writing to his beloved Christian communities, he was writing with grace in his heart, the cause and the companion of his joy in them, and the gift he most wanted for them. Every time we say the ‘Hail Mary’ we begin: “Hail Mary, full of grace, the Lord is with thee.” These words refer to the greeting by the angel Gabriel to Mary at the Annunciation (Lk 1.28). The actual quotation is: “Greetings, O favoured one, the Lord is with you.” Mary is ‘full of grace’ in the prayer because she is the one who was ‘highly favoured’ by God. What this tells us is that grace is something to rejoice in – as Mary certainly did – because it is something favourable bestowed on the recipient. Grace is something real received (the favour itself), and not just a feeling experienced (the joy engendered). A favour, of course, is something that is meant to be of benefit to the receiver; it is something good to be received, not a burden imposed. Therefore, what was bestowed as a favour by God was received as a gift by Mary. And this, too, is backed up in the Greek: charitóō means ‘favour’, and chárisma means ‘gift’. Therefore, to speak of grace as ‘a favour bestowed’ is also to speak of grace as ‘a gift received’. Yet, not every gift is a grace. The gift of an iPad might bring delight to the receiver, but we would hardly call it a grace bestowed by the giver! So, what kind of favour is grace? It is not without reason we call the little prayers we say before meals ‘Grace’. It reminds us that grace is the kind of favour that bestows a blessing. Our Lord often used ‘grace’ in this way. This is nowhere more evident than at the Last Supper when Jesus blessed the bread and wine, which he then freely gave to his disciples as the blessing of his own Body and Blood (Mt 26.26-29). The Greek word used to translate what Jesus said at the Last Supper (and on many other occasions) is eucharistéō, which means both ‘to show favour’, and ‘to give thanks’. This tells us that the blessing of grace is intimately linked to gratitude and thanksgiving. Grace is a blessing that brings forth gratitude and thanksgiving in the one who receives it. It is from this blessing aspect of grace that we arrive at the word ‘Eucharist’, the privileged name the Church gives to the truly great Sacrament of Thanksgiving, given to all of humanity on our journey through life and history. To sum up, we can now see that there is a lovely gathering of words around the word ‘grace’. There is joy, favour and gift happening here. There is also blessing, thanksgiving and gratitude. All of these are exemplified beautifully in the life of the Blessed Virgin Mary, our ‘most highly favoured Lady’. Moreover, this happy confluence of words also suggests to us a simple definition for grace. That’s quite a lot in one word! Welcome to the June edition of “Liturgy Notes”, the liturgy and music section of the Faith & Life e-newsletter. 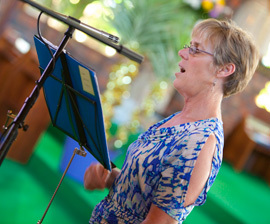 This month sees the announcement of PSALMIST, a new music ministry development program for the Diocese. Also there are details of the upcoming liturgy training and music workshops, a review of one of the Ordinary Time seasonal psalms, as well as our regular section on recommended music selections for upcoming Sunday Masses. PSALMIST, the new music ministry development program for the Diocese, offers a number of significant initiatives. As a Catholic priest who blogs regularly (well, semi-regularly) I am clearly an advocate of the Church’s presence in the new(-ish) world of social media. To say that the Church shouldn’t be a presence on the Web is to turn our back on one of the key places that people gather today. As Pope Benedict XVI has pointed out, the new means of social communication are one of the new areopagi – one of the new sectors of society – that ought to be the focus of the Church’s new evangelisation. We don’t want to disregard the potential of a wonderful tool for the communication of the Gospel. In fact, the Church simply cannot ignore these new means of communication, because like it or not, this is the way people today will want to communicate with us. At the same time, we cannot afford to be naive about the various concerns and questions raised by the new media, including matters of privacy and safety and the narrowing sources of our information as we are increasingly selective about what and who we read. I’d also like to highlight a different concern. In a world where everyone is always online and always connected, the Church may be, in fact needs to be, a ‘place’ where people are able to experience community ‘unplugged’. I’m reminded of a comment by Thomas Merton, who suggested that watching television was the antithesis of contemplation. The gaze that the television produces is the polar opposite of the contemplative gaze. What would Merton have made of Facebook? I cannot help think that he would have thought that it was an ersatz form of the community that is produced by the contemplative gaze. Connecting all the time with friends on Facebook is like people forced to drink chicory in deprived, post-World War Europe. Sure it’s a drink, but it isn’t really coffee. Facebook isn’t a substitute for embodied relationship, or what we simply used to call friendship and community before the advent of ‘friends’ whom you never see face to face. The link between contemplation and genuine community is critical, and being online for hours on end militates against both. And without wanting to deny the human being’s virtually endless capacity for distraction (I’m recalling Neil Postman’s Amusing Ourselves to Death here) I truly believe that the ersatz form of community to be found online will ultimately prove to be as unsatisfying for people as chicory substitutes for coffee. Which brings us to a magnificent opportunity for the Church… to be the Church. To be a ‘place’ which provides a space for genuine contemplation and which produces genuine community. Our necessary presence on the web can and must meet people in their ‘world’, but it needs to invite them into a different one: the world that is opened up by the Gospel, that is incarnated especially in liturgy, and which produces an alternative and distinctive way of being human. I’m completely aware of the apparent irony of using a blog to make this argument, but it is only an apparent irony. It actually reinforces my point that we should make extensive use of the new media in order to connect with people, but we will do that in order to direct them to the contemplative and embodied community of the Church. In particular, this means that we need to be careful of uncritically importing the practices of the new media into our lives and into the Church’s life. Let me offer one example: the Facebook timeline encourages us to offer a chronology of our lives online in words and pictures going right back to the moment of our birth. I am sure there are parents who are even now diligently adding to their infant’s Facebook page, getting them ready to present to their child when they are old enough to read or even see the pictures. The timeline concept clearly raises questions about privacy, but the deeper reality is that it is also a liturgical practice in which we tell ourselves who we are – we form our own identity – through what we post about ourselves. The Church offers another kind of liturgy, which cannot compete with the Facebook timeline for being slick, glossy or initially attractive. But the liturgy of the Church and the other practices of faith like contemplative prayer offer a different account of who we are: that our deepest identity is that we are the beloved of God. This does not mean dispensing with the exciting avenues that the new media offer for proclaiming the Gospel. It means recognising that these avenues are subordinate to the Gospel and not the other way round. The evangelical task for the Church is not to mimic the practices of the new media, but to be authentic to her own identity as the community that is formed by gazing at the face of Christ, who is the face of God. 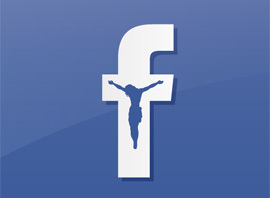 The Australian Catholic Bishops Protocol on Social Networking has further information on this important topic. One of the most rewarding features of my work as Director of CCD involves engaging with Catechists of our Diocese who are just so passionate about their work. Each training day or Parish meeting that I am able to attend allows me to hear unique personal stories from Catechists who love working with kids in State Schools and helping to make the Person of Jesus better known and loved. Catechists engage all types of students, those who are already well formed in faith and those who are hearing many of the stories that are central to our faith for the first time. Much time goes into their preparation for classes. Lesson content is one aspect. Thinking about classroom management techniques is another. Personal prayer too, is another critical factor of lesson preparation that fills our own tank so that we are open to the ‘nudging’ of the Holy Spirit as we share the Faith of the Church with young people. 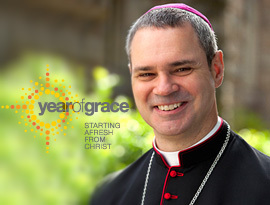 The Year of Grace is a critical chance for all of us in the Church to ‘Start afresh with Christ’. For Catechists it is an opportunity to again embrace our own personal relationship with Jesus, and by so doing ensure that he truly walks beside us as we enter into our classrooms each week. While it is obviously important to ensure that the content of our lessons is true to the approved curriculum, all of the training programs we run for Catechists remind us that one of the most important things we can do each week with students is to bring them to an experience of God in prayer. More than anything else, our lessons endeavour to bring students to a personal encounter with Jesus, and moments of prayer with students do just that. 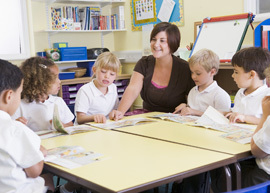 Truly as Catechists, we should desire this to be a year where the students in our care are drawn more deeply into an experience of grace and the most tangible way we can do this is to nurture students’ faith not just through our teaching, but just as critically, through an experience of the Spirit through prayer. How do we as Catechists do this effectively? See our Helpful Hints section below for more information. CatholicCare is bringing Dr Michael Carr-Gregg to the Wollongong Diocese on Monday 25 and Tuesday 26 June. Dr Michael Carr-Gregg appearing by arrangement with Saxton Speakers Bureau (Sydney) will be presenting topics relevant to families and professionals in our community. Dr Carr-Gregg works in a private practice as a nationally registered child and adolescent psychologist. 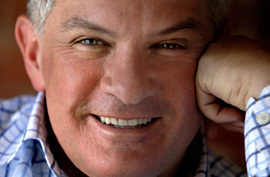 A regular on Channel 7’s Sunrise program, he is an accomplished author, co-founder of CanTeen and a member of various associations including official ambassador for the National Drugs Campaign, Beyondblue, Reach Out and MindMatters. He is passionate about the health and wellbeing of young people and will inform and educate parents about raising healthy, resilient teenagers and dealing with challenges that may arise. CatholicCare Director, Kath McCormack said that the agency invited the high profile child and adolescent psychologist to town because of feedback received from parents that they are feeling overwhelmed. “We know that there are some specific challenges of being a 21st century parent - alcohol, cyber bullying, social media to name a few,” Ms McCormack said. “As someone with extensive experience and wisdom in this area, Dr Carr-Gregg will be outlining key tools parents can use to make relationships with their children healthier,” she continued. Dr Carr-Gregg will be presenting at two different locations, John Therry Catholic School in Campbelltown and St Mary’s Star of the Sea College in Wollongong. To register just go to www.catholiccare.woll.catholic.org.au, click on the Dr Michael Carr-Gregg picture on the home page and follow the registration instructions OR call 4227 1122 for more information. In far west NSW silver city of Broken Hill on the 11 July 1949. I enjoy cereal, fruit, fruit juice and good cup of coffee, sometimes with a slice of toast. What inspired you to becoming a priest? The priests of the Conventional Franciscan order who served the parish where I grew up. They were inviting and welcoming and I enjoyed being with them and being part of their lives. What has been the biggest challenge in your life as a priest? Wondering whether, at 47 years of age, I still had the academic prowess to undertake a Bachelor of Theology degree. Life's experience gave me resources to overcome this challenge. St Francis of Assisi – arising from the Franciscan influence on my early faith development. St Mary of the Cross MacKillop - her wonderful way of interpreting and promoting church in Australia and St Vincent de Paul through the influence of the Saint Vincent de Paul Society in my early years. What has brought you the greatest joy in your life as a priest? Rewarding the people whom I visited as a special minister of the sick while a lay person, with their wish that I would make a good priest for them. The appreciation of knowing that my gifts have been given recognition, that they can bear fruit in praying for and healing many people. Without doubt my fellow clergy in the Diocese, including Bishop Peter. The wonderful inspiration and friendship they provide. Salvation! Jesus' promise that through our baptism and declaration of faith in this wonderful triune God, that we shall share his glory if we do what he commands us. RCIA (The Rite of Christian Initiation of Adults) is the sharing of our faith with people who are looking for a faith to follow. The church encourages this Rite as the way of bringing people into our community. It is a Rite that takes as long as it takes. Within the main Rite there are various liturgies to mark progress. The Rite is aimed at Baptism or Reception into the Church. The period of the Pre-catechumenate where the candidate discusses their development in faith and they are introduced to the basic doctrines and practices of the Church. The Period of the Catechumenate where we share and discuss our faith at some depth. The Period of Purification and Enlightenment This is a special time of prayer and preparation for Easter when the catechumens are Baptised. The Period of Mystagogy. A time of post-Easter reflection on the baptismal experience. I was asked to join the process about 20 years ago by a previous coordinator and have been involved ever since. I find it challenging and rewarding and it leads to deepening of my own knowledge and faith. In Picton parish we are usually meeting people who are interested because they have a close connection with a member of the parish and would like to know more about our faith. In August we have an open night for those interested and if there are any candidates or catechumens, we go on to a short pre-catechumenate and then the catechumenate proper. At the beginning of Lent we have a time of discernment where both the candidates and ourselves together with our parish priest come to a decision about the way forward: to be baptised or received into the Church, to stay in the process for another year or to leave. At Easter the catechumens are Baptised. In prayer, children become aware of the presence of God already around and in them. In a special way, prayer invites them to recognise God's presence in every moment. As a leader of prayer with children, you pray with the children, guiding them into a prayerful time and space. You are both a model and a participant. Create a sense of sacred space by inviting the children to focus on the presence of God. If possible, move the children to a special prayer space in the room. A small table covered with a cloth the colour of the liturgical season can serve as a focal point. On the table place an open Bible, and one or more of the following: a bowl of holy water, a cross, a religious image or statue, a plant or flower, or a candle. If possible, play reflective instrumental music in the background to create an appropriate atmosphere for prayer. As the children gather around the prayer centre, ask them to find positions in which they are comfortable yet alert. Ask the children to breathe slowly by taking in long breaths and letting them out gradually as they relax and become more open to God. Begin by leading the children in praying the Sign of the Cross. Speak slowly, deliberately, and reverently. Sometimes it might be appropriate to involve the children in some bodily action or gestures as a means of reinforcing the prayer experience physically. Remember that to lead prayer does not mean to “do” the prayer for the children. Be aware of how you are leading them to participate, whether it be through silence or through speaking or singing. Foster a welcoming spirit for the prayer time and space. When inviting children to pray aloud in their own words, remember that God welcomes all of us—whether our words sound solemn or silly. If kids get distracted, calmly remind the children that this is a special time of being with God. Invite them to be still once again and to pay attention to their breathing. Be sure to invite the children to spend time in silence with God at home as well so they can become aware of how God wants to be with each of them in a special way. Bring closure to the prayer time by inviting the children to pray the Sign of the Cross.